John Edmund Kirkbride was born in Baxenden in 1884. He was the son of John Slinger and Mary Jane Kirkbride. In 1901 John Edmund was living at 1, Sherfin Side Farm with his parents and brothers Ingram and Benjamin. John, then aged 16 was employed as a cotton cardroom hand at one of the local mills. In 1912 John married Margaret Nuttall. The couple did not have any children. John Edmund joined up about August 1916. Prior to that he was a weaver at Flash Mill, Haslingden. He was formerly connected with Wesley Sunday School and Chapel, Haslingden. At the time of his death his wife was living at Holden Bank Cottages, Grane Road, Haslingden. He was killed in action on 1 August 1917, at the age of 33. John Edmund Kirkbride was killed at the 3rd Battle of Ypres. “On July 24th orders were received for an attack to be made on July 31st, subsidiary to the attack to be made on the same date by the Fifth Army which was just north of the Second Army. The objective of the attack was to capture Hollebeke and to make good a line parallel to and slightly to the west of the road running south from Hollebeke. On the night of 29th/30th (July 1917) the 56th brigade went into the line held in the last tour. The battalion (7th East Lancs.) took over its former sector, holding it as before. The following night (30/31July.) the brigade took up its battle positions with the King’s Own on the right, the 7th East Lancs. in the centre, the 7th North Lancs. on the left and the 7th South Lancs. in Reserve. The battalion was disposed for the attack with all four companies in the line; each company divided into 3 waves. The first wave was to carry out the assault; the second to mop up and the third was the carrying party and was to move forward to a position half way between the starting line and the objective. Zero hour for the attack was 3.50am and at that hour the barrage came down and the battalion advanced through Green Wood. At first there was little opposition but then the troops came under machine gun fire from the direction of Hollebeke. The fire lessened and in a short time most of the strong points had been taken and consolidation began almost at once. During the consolidation the battalion suffered considerably from heavy artillery and machine gun fire. Three officers were killed and one was wounded and over 120 other ranks were killed and wounded. The night of July 31st/August 1st was quiet, but rain began about 8.30pm and continued without cessation for the next 36 hours and on the morning of the 1st August the front line was reported to be knee deep in water. The day was quiet on the battalion front and consolidation continued. In the afternoon the 19th Division was re-organised on a two brigade front. The 58th brigade took over the original right battalion sector and the other 2 sectors were divided into 3, of which the battalion held the right. Each battalion had all companies in the line and each company held the strong points in the captured position. Under this disposition it was possible to relieve the forward posts every 12 hours. John Edmund Kirkbride was killed sometime during this period. Although the official date of death is given a 1 August, it is possible that he could have been killed on the 31st July or 2 August in the action described. The above letter seems strange at John Edmund Kirkbride’s name is listed on Menin Gate Memorial to the Missing at Ypres. In a letter to Mrs. Kirkbride, of Holden Bank Cottages, Grane Road, Haslingden, a pal of her dead husband, Private John Edmund Kirkbride, who was killed in action on August 1st, 1917, says: "Since writing my last letter to you we have received information that your husband's body was found on September 14th, 1917, by another regiment and buried. I feel deeply sorry for you in your sad trouble. I hope you will be consoled by the fact that he died for his country and his cause. He was a good worker, a fine soldier, ever cheerful. Thirty-three years of age, the deceased was a weaver at Flash Mill before joining up on Aujgust 2nd, 1916, and went to the front on November 22nd same year. He was connected with Haslingden Wesley Church. 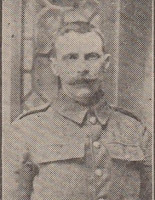 In loving memory of my dear Husband, Private John Edmund Kirkbride, East Lancashire Regiment, who made the supreme sacrifice August 1st 1917. I miss you and mourn you in silence unseen." From his loving Wife Maggie, Holden Bank Farm, Grane Road, Haslingden. May sail with us o'er life's stormy sea. They watch an beckon and wait for me." From his sorrowing Father and Mother, and Brother Ben (in France), Holden Bank Farm, Grane Road, Haslingden. He laid them on the altar - with our tears. From his loving Brother and Sister in law, Tom and Harriet, 15 Granville Road, Morecambe. From Sister and Brother in law, and little Niece Lily. From his Brother and Sister in law, Ben and Alice, 1 Heap Clough, Grane, Haslingden. Between our aching hearts and Thee." From his sorrowing wife, Maggie, Holden Bank Farm, Grane Road, Haslingden. Gain the crown of God's elect." From Father, Mother and Brother, Holden Bank Farm, Haslingden. Hours we cannot share again." Because hearts that have loved never forgot. Love and remembrance live for ever." From his loving brother and sister in law, Frank and Mary Alice, and his niece, Lily, 16 Piccadilly Street, Haslingden.